London, England (CNN) -- A hovering Toblerone and a silky-white residue join near-misses and strange lights in the British government's latest release of its files on UFO sightings. Made public Thursday, the files are the fifth collection of records about unidentified flying objects to be released by the Ministry of Defence and The National Archives as part of a project to open the files up to a wider audience. Thursday's release is the largest so far, totaling more than 6,000 pages of material from 1994 to 2000. The files include a sighting by a man in Birmingham, England, in March 1997. He said he came home from work at 4 a.m. to see a large blue triangle-shaped craft hovering over his back garden. It was silent but caused dogs in the neighborhood to bark, the report said. It "shot off and disappeared" after about three minutes, the report said, leaving behind a "silky-white substance" on the treetops, some of which he saved in a jar. It was not clear what happened to the jar and its contents. Another document, from January 1997, is about a man driving home through south Wales one night when he saw "a 'tube of light' coming down from the sky," which at first seemed like a "massive star" coming toward him. The man's mobile phone and car radio failed, the report said, and the man got out of his car and was able to walk through the light. It said he got back in his car but started feeling sick, and he soon developed a skin condition for which he had to see a doctor. His car was left covered in dirt and dust, the report said. Other reports are about sightings by groups of people, including one from August 1997 in which five members of a fishing trawler in the North Sea reported seeing a round, flat, shiny object hovering in the sky. They saw it both with the naked eye and through binoculars, with the report noting, "witness very skeptical of UFOs." They tracked the object on their radar for several seconds before it vanished, the report said. Police officers in Boston, England, and Skegness -- both on England's east coast, caught a UFO on video at the same time that the Royal Air Force (RAF) detected an "unidentified blip" on their radar, the files show. It happened in October 1996, when the officers saw "strange rotating red, blue, green and white flashing lights in the sky," the report said. A ship in The Wash, a bay near Boston, also saw the lights, and at the same time RAF air defense radars picked up the blip over Boston, the report said. Press coverage of the incident led the RAF to look into the lights, later identifying some as stars and bright planets, and attributing the radar blip to a "permanent echo" created by a nearby church spire. The release highlights how the reported shapes of UFOs have changed during the past half-century, the National Archives said. Many of the reports in the latest file describe UFOs as big, black and triangular, whereas reports from the 1940s and '50s tended to be about saucers or disc-shaped objects, they said. "In the 1950s the next big leap in technology was thought to be a round craft that took off vertically, and it's intriguing to note that this is the same period when people began to report seeing 'flying saucers' in the sky," said David Clarke, author of a book called The UFO Files and a journalism lecturer at Sheffield Hallam University. He pointed out that in the years covered by the latest file release, triangle-shaped U.S. stealth bombers and Aurora spy planes featured heavily on TV shows like "The X-Files" and movies like Independence Day. "It's impossible to prove a direct link between what people are reading and watching and what they report as UFOs, but one interpretation could be that the latest advances in technology may be influencing what people see in the sky," he said. A craving for chocolate may have influenced another sighting, that of a "Toblerone-shaped" UFO hovering over Annandale, Scotland, in July 1994. The Toblerone is a triangular-shaped Swiss chocolate candy bar. 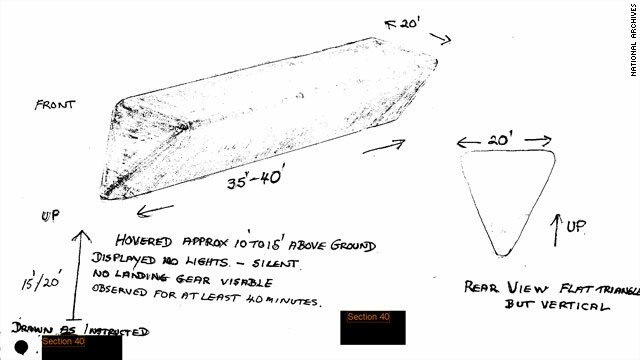 The files include a sketch of the object, which showed it as 35-40 feet long and about 20 feet wide. It hovered silently about 10 feet above a field with no lights and was "observed for at least 40 minutes," the report said. The release also contains several incidents involving UFOs and aircraft, such as a near-miss that happened in January 1995 when a British Airways Boeing 737 was approaching Manchester airport. The captain and a crew member saw the object, but an investigation by the Civil Aviation Authority failed to identify it, the report said. An airliner near Glasgow Airport saw white and red flashing lights in December 1996, but the report simply concluded there was no RAF activity in the area at the time.